On September 30th, 2015, Russia deployed a battle group of bombers at the air base at Hmeymim, and started a bombing campaign against Islamist rebels in Syria. On November 23rd, 2015, President Vladimir Putin arrived on a visit to Iran. It is assumed that Putin would have asked permission to use Iran's Hamedan air base for heavy bombers, that would act in Syria. Conditioning the supply of Russian anti-aircraft missiles of the S-300 type to Iran, by the authorization to use this airbase, Putin saw needing these S-300 systems to provide cover for Russian heavy bombers deployed in Iran. Incidentally, version of S-300's delivered to Iran are the most powerful, being close to the S-400. Before the 1979 Islamic revolution, the US had created a latest generation airfield in Iran able to operate, arm, and maintain American B-52 heavy bombers and supersonic B-58 bombers in case of a conflict with the USSR. So heavy bombers like the Tu-22M3 have much better facilities in Iran than in Syria for rearming and maintenance. Two aviation bombs for Su-24 light bombers, Su-25 and Su-34 can be assembled and electronically tested at the platform of Hmeymim air base in Syria. 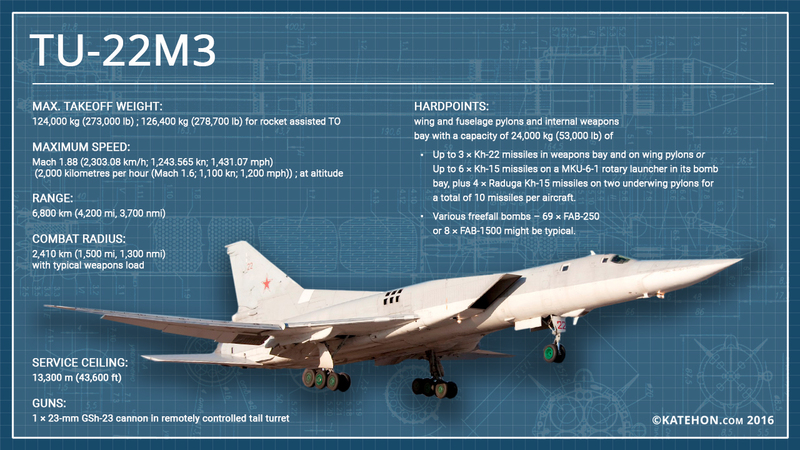 But when it comes to 40-90 bombs, used by the Tu-22M3, they needs a specially designed technical group, many engineers and specialized machinery. In late July 2016, the Syrian army managed to cut off Islamist rebels access to Castello road that connects Aleppo with the governorate of Idlib in northwestern Syria, occupied by rebels. The Syrian army maneuver is to isolate the group of 10,000 fighters, and circle in east Aleppo. Islamist rebels have managed to transfer around 20,000 fighters in Idlib overnight, which began two counter-attacks in the northwest and south of Aleppo, to break the encirclement. Although Russian unmanned recon aircraft detected the early formation of several columns of massive troop transports, supply ammunition and armored rebels, the few Russian bombers could only neutralize a few of them. The distance of 55 km that separates Idlib to Aleppo can be traveled in one hour by rebel trucks and armored equipment. The few remaining Russian bombers at Hmeymim air base in Syria (Su-24 and Su-25), after the failed attempt to impose a ceasefire (February 27th 2015), can execute 2-3 sorties each day, each airplane needing 2-3 hours for fueling and loading to return to the target. These planes are each armed with 2-4 smart bombs, high accuracy (KAB-250 S / LG 250 kg KAB-500 L / 500 kg Kr KAB-1500 L laser-guided KAB-1500 or Kr, Tv room-guided). Or missiles or air-ground type gidate Kh-29 L / T and T Kh-25 (guided by laser beam or TV camera), launched from a distance 10-12 km to the target. It is known that Islamist rebels continue to oppose Syrian ground troops with fierce resistance, due to the protection offered by the underground tunnels, use of difficult terrain in northwestern Syria, and modern American antitank weapons, with which they were given. In the analysis published on December 2nd, 2015 I argued that Russia has made an error when it hesitated bringing at least 30 heavy bombers of the Tu-22M3, Tu-95MS and possibly Tu-160 types to a neighboring country, where each could execute daily flights, three combat flights by each . Heavy bomber sorties would be aimed at the destruction of infrastructure of the Islamist rebels, including the storage of weapons and ammunition in the Idlib governorate and in the northern Aleppo governorate, and the destruction of Islamist fighters. The missions of the Russian heavy bombers are being conducted on a strip 20-30 km deep within Syria, with a length of about 70-80 km, in the governorates of Aleppo, Idleb and Latakia. Only after the border strip was cleaned up with bombing runs, could it be secured by the Syrian army, and Russian bombings could then be expanded into other areas of Syria. Unlike tactical bombers Su-24, Su-25 and Su-34, used by the Russians in Syria, one Russian heavy bomber Tu-22M3 may cover an area equivalent to several football fields in one mission. Moreover, in the invasion of Iraq in 2003, the US-led coalition has used about 1,400 combat aircraft, of which in the first days of operation, over 100 heavy bombers US B-2, B-52 and B-1B acted. On August 15th, 2016, Al Masdar News published photos of three Tu-22M3 Russian heavy bombers deployed air base Hamedan in western Iran. On August 16th, 2016, Tu-22M3's, along with four light bombers (Su-34') bombed targets of the Islamic State and Jabhat al-Nusrat in Seraquib (5 km east of Idlib), Al-Bab (northeastern governorate of Aleppo) and Deir ez-Zor, Syria. Previously, teams of Russian Tu-22M3 aircraft, which have a maximum flight distance of 4900 km, took off from the air base Mozdok (North Ossetia), flying over the Caspian Sea, Iran and Iraq. 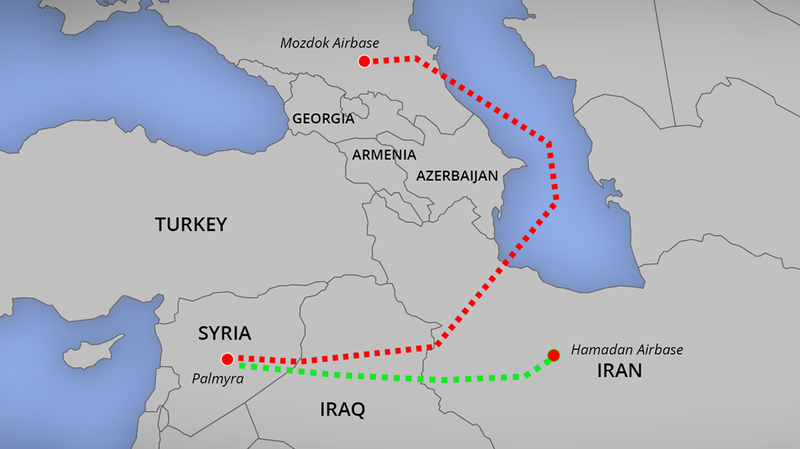 Because it was close to its load maximum (9000 kg), the number of bombs were reduced to one third in favor of a larger fuel reserves.The distance between targets in Syria and the Mozdok air base is over 2100 km, but if using the air base at Hamedan in Iran, the distance is reduced three times, i.e to 700 km. A Russian Su-34 bomber landed at Hamadan Air Base on November 23rd, 2015. Most likely the Su-34 plane was en route to Syria and had a technical issue, preferring to land safely at Hamadan. There it was met by a technical team which arrived on November 24th, 2015, aboard an IL-76 cargo plane, and made repairs. 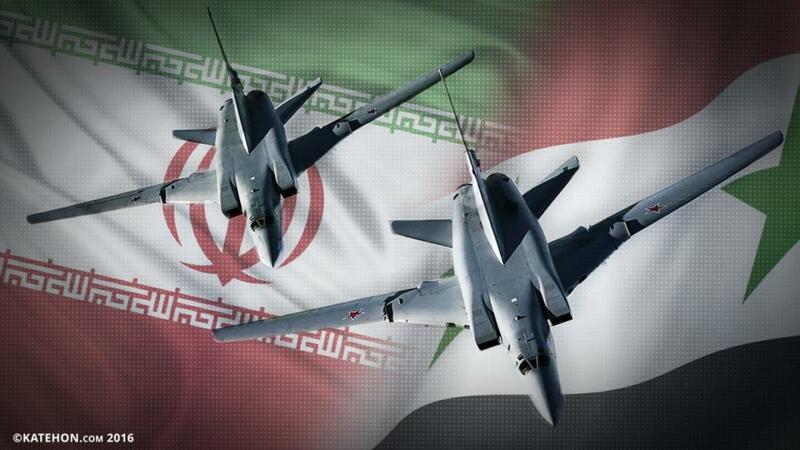 Both planes left the Hamadan airbase. It is possible that the moving of heavy Russian bombers to the air base at Hamadan was postponed until all five Russian battalions of antiaircraft missiles, that were delivered to Iran since April 15th, 2015, has become operational and their crews were trained. One of the five battalions of S-300's was located south of Tehran, i.e. less than 100 km from Hamadan Air Base. The S-300 system consists of eight launchers on a truck chassis, each with four missiles on the ramp. It is able to track 100 air targets and engage in combat with as many as 36 of them from a distance of over 200 km.